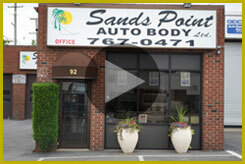 At Sands Point Auto Body, our mission is to provide high quality, convenient and comprehensive auto body repair services at competitive prices. The most important aspect of our business is trust. It is the goal of our firm to have 100% customer satisfaction in regards to quality, friendliness, and time to completion. © 2015 Sands Point Auto Body LTD.